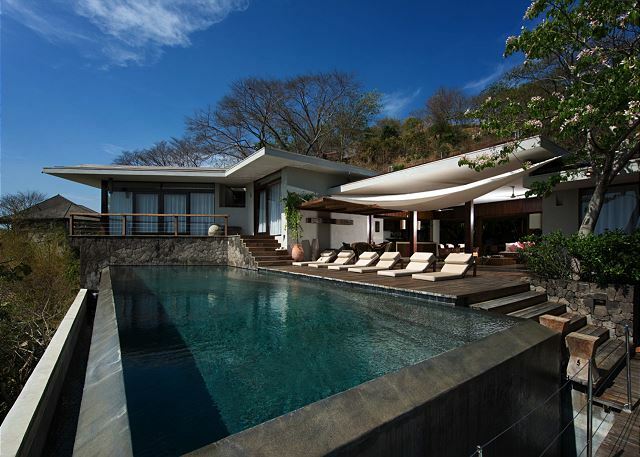 Casa Puros Dieces, the crown jewel of Tamarindo luxury real estate, sits proudly atop a verdant hillside overlooking unspoiled views of Costa Rica's majestic Pacific Coast. 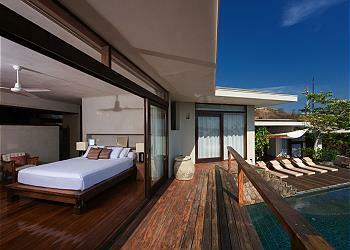 One glance at the cerulean sea and you'll know these are panoramic ocean views worth writing home about. In addition to its unbeatable views, Casa Puros Dieces boasts immaculate landscaping that incorporates local flora and fauna into the very framework of the house and its gardens. Designed by Costa Rica's most renowned architects, Casa Puros Dieces is a modern marvel in and of itself. Pacific Rim tropical design and Balinese inspired architecture make indoor/outdoor living a way of life here at Casa Puros Dieces. 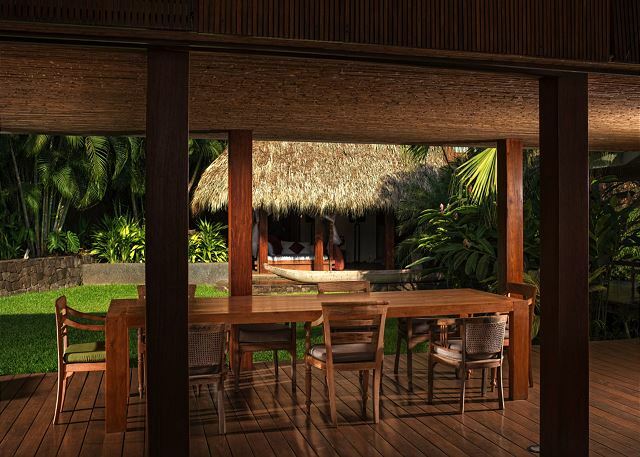 You'll feel like you've arrived in paradise as you traverse the sprawling bungalows and experience the true meaning of intelligent eco-design. Open air patios flow into the living room so you might be sipping coffee on the couch one moment, and then be outside dipping your toes in the deck's built-in infinity pool the next. On a gorgeous day, the house opens up so that the tropical breeze gently circulates through every room of the house. Elements not cooperating? Needing some more privacy? You can simply close the giant sliding Balinese doors, adding walls to separate the indoors from the outdoors whenever you desire. This luxurious jungle bungalow is truly one of a kind. With the capacity to accommodate groups of up to 20 guests, Casa Puros Dieces makes the perfect venue for weddings or large family/friend groups. There's no amenity our team at Stay in Tamarindo can't transform from dream to reality during your stay at Casa Puros Dieces. This is truly one of the most special and exclusive luxury homes in all of Costa Rica, and we want your experience to go above and beyond anything you've ever experienced. Maybe it's a private chef preparing the fresh fish you caught on that morning's sportfishing cruise for dinner... perhaps it's the region's top masseur coming to pamper you with an exotic coffee scrub in the bamboo spa and meditation room... Maybe it's both those things and more? 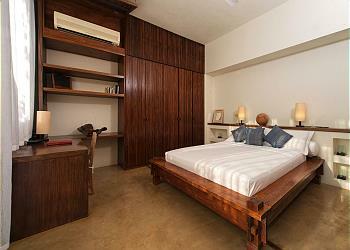 Whatever you can dream, we can do it here at Casa Puros Dieces with Stay in Tamarindo on call. 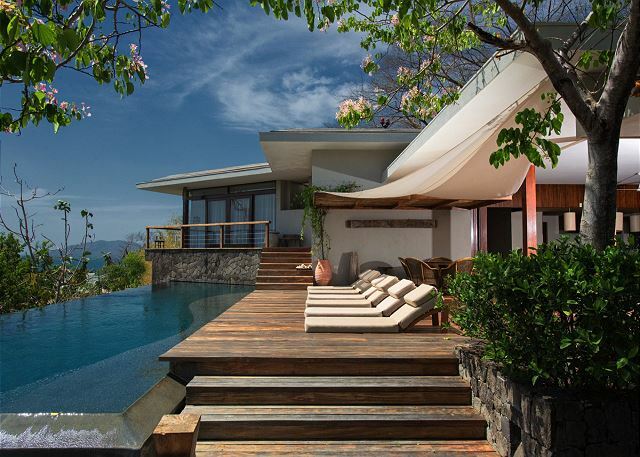 This stunning villa is the perfect spot to experience the best comfort, location, and amenities Costa Rica has to offer. 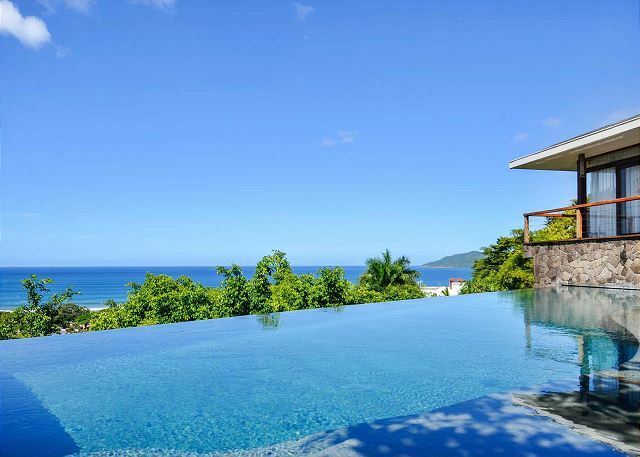 When it comes to tropical luxury and five-star vacations, Casa Puros Dieces is the ideal spot to fully maximize your dream vacation in Costa Rica. This house is absolutely amazing. Love the open layout of this house. The housekeepers work hard to maintain the property and it shows. Being able to watch Tamarindo's amazing sunsets from the infinity pool was the best. Ben, Thank you! We are really happy to know you loved the house and found it beautiful, also, that you and your group were able to see the magnificent sunsets from the comfort of the infinity pool. 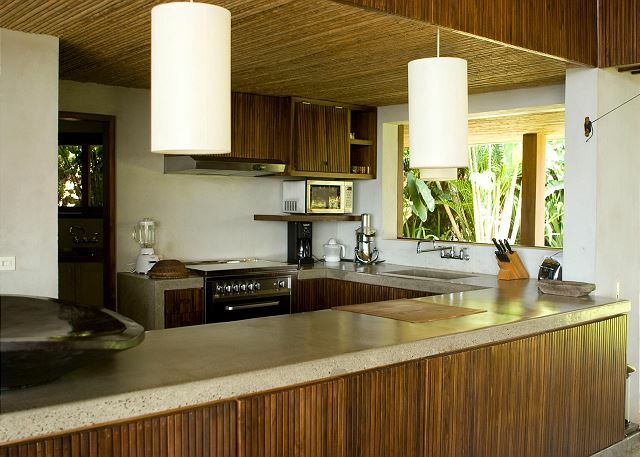 It is true Casa Puros Dieces has one of the best views of Tamarindo. Thank you for recognizing the hard work of our staff, they always do their best to keep the house in an impeccable condition. Thank you for staying with us and please let us know next time you are coming back to Tamarindo, as we would love to assist you again. Cheers! Paradise !!! The Best Vacation Ever !!! It was one of the greatest vacations we ever had. We were a group of 8 golfers. The golf courses were fantastic, I can't say enough about the house. It was magnificent, breathtaking, beautiful. The staff is a perfect 10, they made us feel right at home. Thank you to Jorge, Kendy & Jessica. The only thing that we would do different is rent gas golf carts instead of the battery operated ones, they had trouble getting up the hill. We will definitely come back to Casa Puros Dieces !!! Thank you so much Adrian for your great review! It really means a lot that you loved your stay and that was one of the greatest vacation you ever had ;) We are so happy you had such an amazing vacation and that you enjoyed Casa Puros Dieces. It is true the staff is awesome and they are always so nice and helpful and are always there to assist you in anything you need. We look forward your next visit to sunny Tamarindo and Puros Dieces. Pura Vida! Thank you Robercy! Glad you had an excellent stay. It was a pleasure to assist you and we hope you and your group come back soon for a visit! Kind regards, Stay in Tamarindo Team. This home was absolutely stunning, the pictures do not do it justice. We had 18 people stay in this home. Each room has a private bath (one room has a bath that is in an open area but the view made up for the walk to the bathroom). There is a day staff that speaks little english but are very helpful. Get your golf carts reserved before you get there, they sold out and it is a hike up to this house. Also, bring some extra face clothes and towels as they are limited in the home. We would definitely stay again. This was a dream home! Stayintamarindo was a good company to work with as well. Natalie, Thank you for your kind review, we are so happy to hear you had a great time and love the house. It s true Casa Puros Dieces is the perfect house for a big group like yours as it has plenty of space. Thank you again for staying with us and hope you can come back very soon for a visit! Amazing luxurious home with our friends for our wedding! 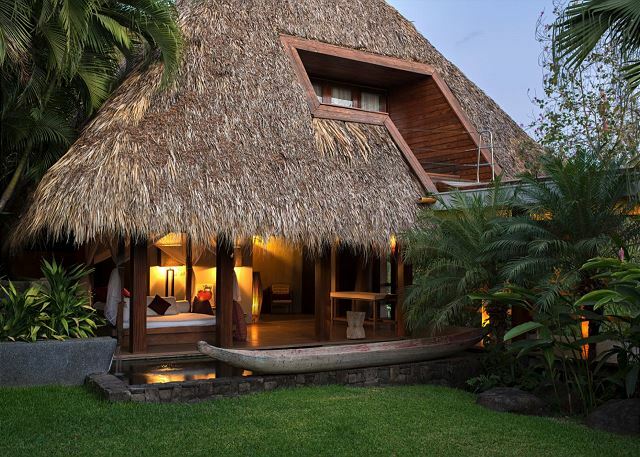 We rented this house with all our closest friends who had decided to travel to Costa Rica to celebrate our wedding. The house exceeded our expectations and we all had an amazing time. There was help during the day to change your sheets or help with laundry if needed. There was a guard at night just for extra piece of mind. We loved it so much and would come back again in a heartbeat. The only disclaimer is that the road is not far to the beach, but it is unpacked and a little steep. Get a car or know your legs are going to be in better shape than when you got there! We walked up and down multiple times a day, but wouldn’t be good with kids or someone with a disability; wheels would be good! The pool and hanging areas were AMAZING! If your consider staying, you should. Pura Vida! Amanda, Thank you for taking the time and sharing your impressions with us and future guests. We are happy to hear that you have enjoyed you time in Casa Puros Dieces and that exceeded your expectations. We hope to see you again for another round. All the best and warm regards! We had an amazing time at Casa Puros Dieces. 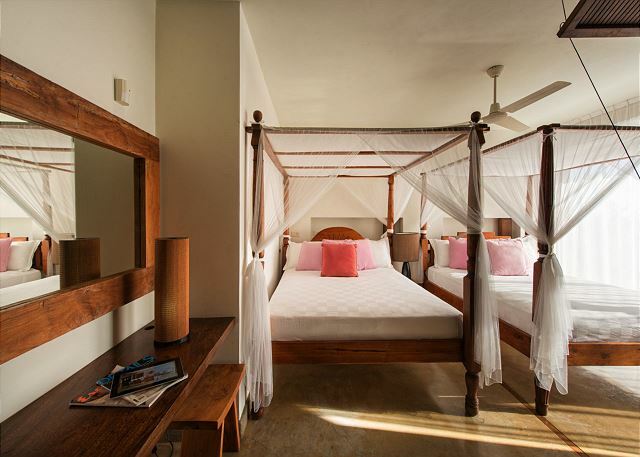 The Stay in Tamarindo staff was amazing and helped coordinate catering, transportation, massage therapist, and excursions. We rented golf carts, which we used to go into town, to the beach, etc. We surfed one day and went on a sailboat cruise another. Such a great experience! The house and views were beautiful. All of the rooms were clean and spacious, and the beds and furniture were comfortable. Our visit was during rainy season, and the open living area allowed us to enjoy meals and relaxation while we enjoyed listening to and watching the rain. It only rained for a few hours each day, which allowed us to have quality time both inside and out. Lastly, the house staff was very welcoming, kind and helpful. 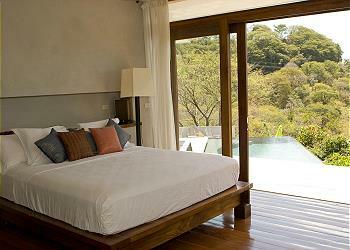 I would definitely recommend this home to anyone looking into Costa Rica. Pura vida! Thank you Laura! We're thrilled to know everything went great with your trip! It was our pleasure assisting you during your vacation. I'm so happy to hear how much you enjoyed the staff and services provided. and we look forward to welcoming you back for another round very soon! 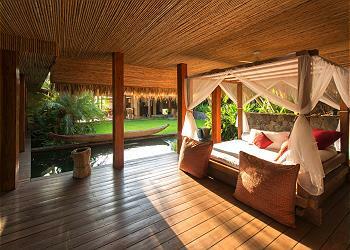 We have travelled to the Tamarindo/Langosta area 5 times and this was by far our favorite spot to stay. Fantastic Villa, perfect for large families and groups. Concierge service was top notch dealing with Cristina and Adriana. They set up a private fishing excursion, sailing and snorkeling, as well as surf lessons. We even had a chef and his staff come in and prepare a few dinners and breakfast each morning. The cleaning staff and security were also great. They went above and beyond and even did laundry while we were out. BJay, your kinds words and effort to share this with us is well appreciated. We are happy to hear you had a memorable time here. Our location is a real asset, but it's nice to see that our effort in Service and our arrangments find its recognition as well. Thanks again and hope to have you back very soon! The experience exceeded my expectation. Tia, its great to know you had an awesome experience and that exceeded your expectations! We hope you come back very soon! We are still on cloud 9 from our wedding week in Tamarindo at Casa Puros Dieces. We are from Los Angeles and had our destination wedding at Casa Puros Dieces. It was the perfect place for 12 of us to stay for the week to relax, bond, and have our dream wedding. 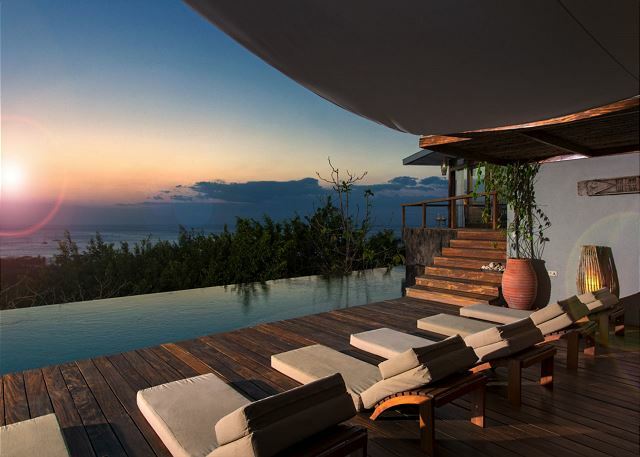 The house is so unique with all of the outdoor common areas and the awesome infinity pool overlooking the ocean for those spectacular Costa Rican sunsets. The house was the perfect setting for our intimate wedding ceremony and reception. Danny, Dinorah and the rest of the full time in-house staff were incredible. They kept the whole house spotless every single day we were there. 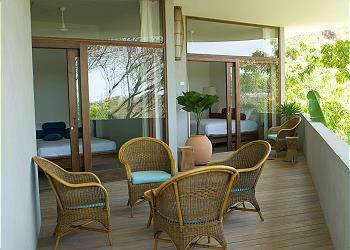 The staff at Stay in Tamarindo, especially Adriana and Cristina were so helpful during the entire planning process. We communicated via email and they helped make our experience unforgettable. The house is in a great location, safe, quiet, and just a short walk down the hill to the beach and into town to the surf shops, bars, and restaurants. We rented a couple golf carts for easy access to and from the house. The house is on a steep dirt road so a car, taxi, or golf cart to/from the house is recommended, especially at night. We can't wait for our next trip to Costa Rica. Pura Vida! Thank you Nick! It is true that Casa Puros Dieces is absolutely perfect as a wedding venue, being so big and spacious and with that wonderful patio/pool area! It's great to know everything went perfect with your wedding. Thank you for your kind review and your positive comments about the house staff and our team members, it was our pleasure to assist before and during your stay. 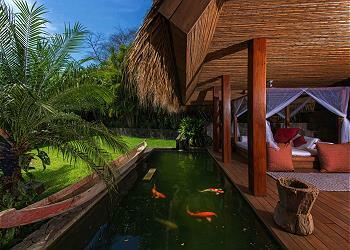 We look forward to welcome you soon again in sunny Costa Rica! This house is a dream. The bedrooms are very nice. The common area is awesome! Outdoor kitchen and living rooms right off the pool was great. Two refrigerators and all the cooking utensils you could ask for. The pool is gorgeous and we had a family of monkeys visit us one day just 10 feet away in the trees. There is also a full staff that we were not expecting but were very happy to have. Two ladies cleaned for us for 5-6 hours per day, a handy man was there to fix anything we needed and a security guard sat out front all night. They were all very nice and we hardly noticed them working around the house. The hot tub was not working the first two days but they were able to get it fixed for the second two nights we were there. No big deal at all. Just can't say enough about this place and how much we enjoyed it. Thank you Ryan! Nothing makes us happier than happy guests. It's great to know you had an amazing experience and that you enjoyed the house during your stay. Thank you again for staying with us and hope you come back for a visit soon! Everything about this property was perfect, the view, the location, the staff and the space. Thank you Heather, nothing makes us happier than happy guests! Thank you again for staying with us! Come back soon! Pura vida. We were a group of 19 people (kids and adults) that celebrated my 40th birthday in this absolutely fantastic and gorgeous home! 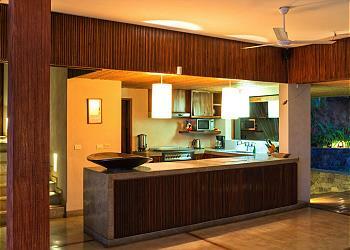 Right from when we stepped in, we were blown away by the beauty of the location and architecture of the home! Every room was very well maintained and unique. The on-location help were very friendly and always with a smile on their faces. They helped out with everything and kept the home absolutely clean and functional for such a large group. Highly recommend this property! Renu, thank you so much! We are thrilled you that you had an amazing time and enjoyed the house and the area! It was a pleasure to assist you during your stay and we hope you will come back again to visit! Pura vida!" We had half of our wedding party staying at Casa Puros Dieces and also hosted our ceremony by the pool. The views are beautiful and our accommodation was very comfortable. The staff were friendly and accommodating and we felt very well looked after. The property felt a lot bigger than we were expecting from the photos which meant that it was easy to find somewhere to chill out, even when the kids were playing in the pool. One thing to note is that there are a lot of stairs and slopes between the rooms so this might not be suitable for less mobile guests. There is also a steep hill to climb to reach the house, but we had no issues getting taxis to pick us up. Thank you Matt! Casa Puros Dieces was the perfect location for a wedding group!Glad to hear you like the house and you had a great time. Also, it is true, the hill can be a bit tough but then again without it there wouldn't be such an amazing view :-) Thanks again for staying with us! Pura vida!" We had a wonderful time at Casa Puros Dieces. 12 of us stayed there a week and I can't say enough about the house and the staff. Jorge and the women who he worked with took such good care of us. They were helpful and cheery, but unobtrusive. The house is gorgeous - the pool is fantastic, with lots of outdoor common areas to take advantage of the beautiful weather. I would highly recommend this property! Dear Paul. Thank you very much for your words. We're thrilled to know everything went great with your stay! It was our pleasure assisting you during your vacation and we are so happy to hear how much you enjoyed the staff and services provided. We'll make sure to pass on your kind comments to the house staff! We hope you, your family and friends will come back again to visit! Pura Vida!" Amazing Home, Even better Staff! Casa Puros Dieces was by far the best vacation rental I've ever stayed in. We came to Costa Rica for my fathers 60th birthday and it exceeded all expectations. The location was perfect, just outside of town and easy to walk to the beach. All of the house staff was incredibly friendly and a pleasure to have around. Property management was easy to work with and helped us with anything we needed and most importantly the house was amazing! It's even more beautiful than it looks in the pictures. The layout was great for our family, with separate room suites all over the house. With it's balinese style architecture and furnishing it gives a tropical vibe that helped us relax as soon as we walked in. 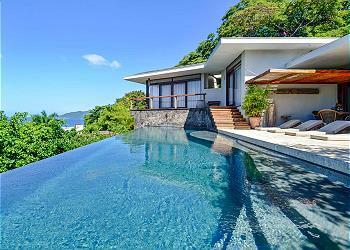 And the pool/views were incredible from just about anywhere in the entire home. If you have a big group and are even thinking about going to Costa Rica this is the only house to consider! David and family! It's great to know you had an amazing experience and celebrated your dad's birthday at the perfect location :-) It is true the house is beautiful: surrounded by nature and still close from the beach and town. It was really OUR pleasure to assist you throughout your trip and we hope to have you back very soon! Pura Vida!" Thank you Shalvi! 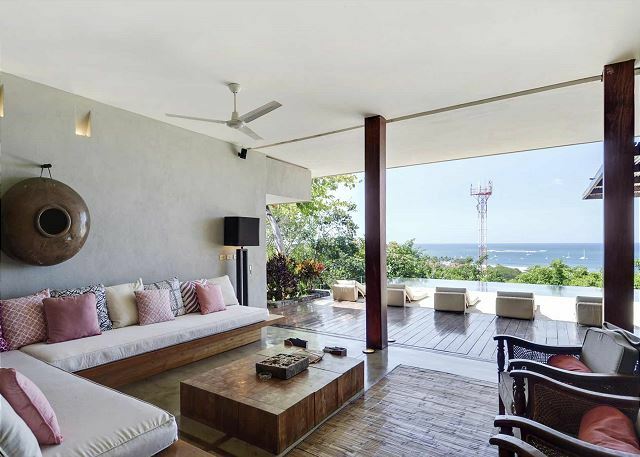 Casa Puros Dieces really does have everything you need for a perfect vacation, and it's just a short walk from the beach and downtown Tamarindo! It was a pleasure to assist you with your requests and activities, we would love to have you back whenever you're ready! :-) Thank you again for staying with us! The property is stunning. We had a guys trip with 13 people from San Diego, everyone slept comfortably and was very impressed with the staff and home. The hill is a little steep and dark at night, I would recommend a taxi. The team helped book a private catamaran and airport shuttles, everything was taken care of. Highly recommend. Thank you Philip! We're thrilled to know everything went great with your trip, we'll make sure to pass on your kind comments to the house staff! 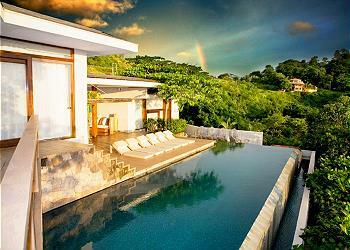 Thank you again for staying with us, Pura vida! This house is simply fantastic!!! 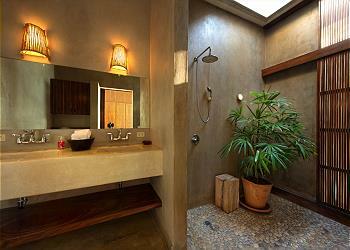 From the bathrooms, bedrooms, common areas, and pool space - it's sensational. It's a short walk to town with a bit of a hill but very doable. I also have to mention the cleaning staff which was equally terrific. It was so nice to wake up to a clean house and laundry every morning with smiles all around. Thumbs up on this one!! Wonderful Stay at Casa Puros Dieces! My family of 20 came to stay in August, the beginning of green season, which was no problem as it only rained 30 min/ day. The property is gorgeous and clean. 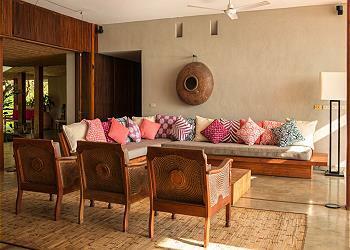 It's also the biggest villa in Tamarindo that can house this many people under one roof. 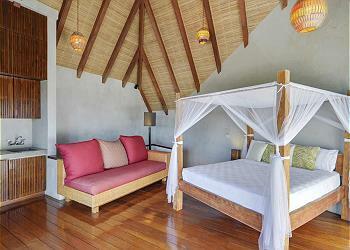 All the bedrooms have A/C, an indoor/outdoor shower, and a view! The kitchen was substantial, we cooked there everyday and bought food from the local market. We swam in the pool everyday and used the hot tub every night. The house staff felt like family, they were easy to talk to and helped us with whatever we needed. They even gave me a parting gift, which is hanging right now in my house! The staff leaves at 4pm and a night guard comes from 5pm - 5am every night, although he is optional. We held our wedding ceremony on the lawn of the property and every picture we took had an amazing background. The location is perfect although I suggest you rent a golf cart because the hill to the villa is not paved and very steep. But for our guests without carts or cars, were still able to walk up and down from the house to the main road, 10 min walk. Remember to bring SPF, bug spray, and US dollars in small bills. We did the All-day Adventure Tour, Deep Sea Fishing, and Sunset Catamaran Tour. And from the beach across the street we caught a Horseback Riding Excursion that goes along the beach and to the top of the mountain. I hope that we can come back to this magical place. It really is as beautiful as it is in the pictures. Bravo Casa Puros Dieces! You have made me feel like a hero to my family. They can't stop talking about their vacation in Costa Rica. Pura Vida!! Thank you Amelie! We're thrilled to know you had an amazing experience and brought home plenty of beautiful memories! :-) Thank you again for staying with us!! Puros Dieces was the perfect home for our family vacation of 9 adults and 5 children. The staff was amazing, the views spectacular, and the location made getting to restaurants, shops, and the ocean easy. This house made our trip! It was seriously a dream house. The staff were all so helpful and accommodating. There is not a bad thing I would say about this home.